A glacier is formed when more snow falls during winters than melts during summers. Glacial layers are kind of like a tree’s annual rings, a glacier’s history book. Some layers are full of air bubbles, while in others, the ice is clear and glassy. Some are full of gravel and dirt, telling the story of landslides or avalanches. Today, more than half of the Svalbard archipelago is covered in glacial ice, and the settlement of Longyearbyen is surrounded by ice caves that tell the story of Svalbard before it was covered in ice. And this is the story that Professor Ivar Berthling at the Department of Geography at NTNU wants to tell. The ice caves in Longyearbyen contain plants and old soil preserved at the bottom of the glacier from when it was much smaller. The plants grew up into the ice as the glacier formed. “This is something that happened almost 1000 years ago. In the period right after the last ice age, there were likely far fewer glaciers on Svalbard. Few of the glaciers on mainland Norway have been there for the entire period since the last ice age. Between six and eight thousand years ago, there weren’t very many glaciers in Norway, certainly far fewer than we have today,” Berthling says. For this reason, he believes that a non-glacial Svalbard is nothing new. “We are, however, still in a situation where we are seeing large changes in the climate on Svalbard. And we don’t know all of the consequences of this,” Berthling continues. High air temperatures and radiation are the reasons why the glaciers are melting. “Most of the glaciers around the world are melting. This includes the glaciers on Svalbard, although it doesn’t mean that they are in immediate danger of disappearing. There are still large areas where new glacial ice is forming, over what is called the equilibrium line of a glacier. This is where more snow falls in the winter than melts in the summer,” Berthling says. On Svalbard, you can safely go inside glaciers during the winter, because it is very cold. The glaciers on mainland Norway can be warmer and softer, making travel under the ice more dangerous. “The caves on Svalbard are special. Normally, water from melting ice on top can easily find its way down though the glacier, running through cracks and crevices, and making the glacier softer. But if the ice is cold, like on Svalbard, water can’t get down through the ice,” Berthling explains. “Instead, it runs along the surface, carving channel deep into the ice which eventually close up on the surface. Some channels make it all of the way to the bottom of the glacier, forming ice caves. Because the glacial ice is cold and hard, these caves are safe to visit during the winter,” he continues. On Svalbard, many of the glaciers are frozen to the ground, and therefore don’t carve into the landscape underneath the way glaciers in warmer places do. “Most glaciers are temperate, and have water along their base. The glacier slides along its base, polishing and grinding down the earth underneath it. But Svalbard is a special case. Since the climate is cold, the glaciers are frozen to the ground, so they preserve the underlying landscape rather than reshaping it,” say Berthling. 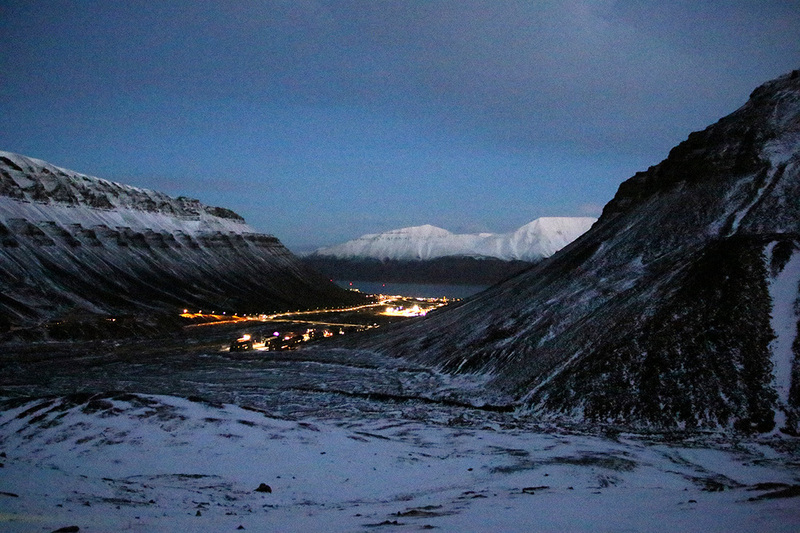 A landslide in the autumn of 2016 caused an number of Longyearbyen inhabitants to evacuate. This landslide was caused by warmer, wetter weather. The ground on Svalbard is frozen year round, a phenomenon called permafrost. During the summer, the very top layer melts of soil melts, but the warmer winters of late have caused changes in permafrost temperatures, and the thickness of the top layer of permafrost that thaws each summer is increasing. “Almost all of Svalbard is underlain by permafrost, and temperature measurements show that it has been changing drastically over the last few years. The thawed layer over the permafrost is becoming thicker, and the ice farther down is melting. The permafrost is thawing out,” Berthling explains. This increases the risk of living in Longyearbyen. “We’ve seen this several times throughout the course of the previous fall and winter, with landslides and avalanches. We’ve had a lot of precipitation, and a thick active layer over the permafrost, with a lot of ice melting. That means there is a lot of water in the ground, which can cause landslides. The settlement of Longyearbyen is at the base of a steep valley. Unfortunately, we’ve seen the consequences of avalanches, when two people died in 2015, but landslides may be a potential risk to our inhabitants as well. However, as long as we have a good warning system in place, the situation is fairly safe,” Berthling said.